"This is another big step forward in using the power of digitalization and increased connectivity to deliver smarter and more efficient services," said Knut Ørbeck-Nilssen, CEO of DNV GL - Maritime. "Remote surveys allow us to free up time for our customers, while delivering our services with unparalleled response time. In addition, cutting down on unnecessary travel can result in lower costs, less waiting, and more operational up-time. We've had a great response from our customers and support from major flag states, and we are deeply appreciative of the feedback provided to us to make this project a great success." The Scorpio Group was one of the first remote survey users: "We saw this as a way to utilize the extensive competence within DNV GL," said Scorpio Group managing director Francesco Bellusci. "Now we can apply DNV GL's competence wherever we are, while also involving our own expertise in the process. Remote surveying makes both the process and the expertise mobile." 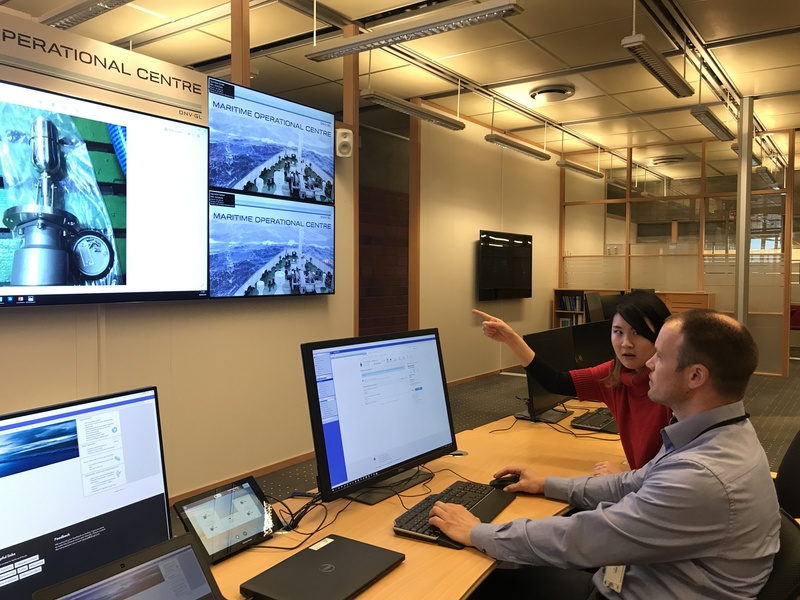 "Our technical team and senior management recently met with DNV GL at their Maritime Operational Centre in Høvik and were impressed with the demonstration of the society's infrastructure and technology to support their remote survey capability," said John Ramage, Chief Operating Officer of International Registries, Inc. "The Marshall Islands Registry recognizes this is an innovative solution and is pleased to support DNV GL in improving service delivery to our mutual clients," he concluded. When a customer makes a survey request through DNV GL's fleet portal on the Veracity platform, they may, for some survey types, be given the option by the system to choose to carry out the survey remotely. All such survey requests are then evaluated by a remote surveyor to make sure that the survey can be offered remotely. The remote survey regime has been constructed to ensure that the level of assurance is equivalent to an onboard survey. "We are running the remote surveys through our popular DATE hubs," said Knut Ørbeck-Nilssen. "This gives us consistency in how the surveys are handled and the ability to offer around the clock service anywhere in the world at exceptional quality levels. In addition, the introduction of electronic certificates for all vessels, which allows us to publish and transmit the survey results immediately, has been pivotal to our successful launch of remote surveys." The types of surveys able to be offered as remote surveys include: occasional surveys that fall between periodical surveys, documentation-based surveys, testing and witnessing systems during normal operation, and surveys not ordered together with annual surveys. Periodical surveys like the annual survey of a vessel are not part of the remote survey programme as they require a surveyor onboard.